I have always wanted to be a stay at home mom. Always! I loved the idea of not having to answer to anyone, being on my own schedule, and catching up on DVR. But, as moms, we all know we are rarely on our own schedule, but rather our children’s. And the DVR, well…it just has to wait until the kids are in bed. No one really tells you that staying home all day with kids is a job in itself. A hard one at that. I do love it though, and I wouldn’t trade it for anything. One thing that has made it easier for me is having a schedule to follow. As a mom, flexibility just has to come with the territory, but following a general guideline can make your day much more productive and happy. 1. Wake up earlier than the kids. I get the most done in the hour before the monsters arise and the chaos begins. Have a cup of coffee and get your cape on, because you need to be ready to take on the day. When you wake up earlier than the kids, you have time for yourself. You could get a little self-care in, some personal development, or just relax and brace yourself for the day ahead. For me, I prefer to turn on the morning news (because when they wake up, it’s goodbye Today Show and hello Fancy Nancy). When you have the time to plan ahead and actually wake up on your own (as opposed to two little ones staring at you screaming that they are hungry), then you can ease into the day and set the tone for yourself. I don’t know anyone who enjoys being in a rush, especially busy mamas who already have busy days as it is. 2. Make a to-do list for the day. Not a whole lot feels better than checking off little boxes of accomplishment, amiright!? Bonus points if you make the to-do list the night before. Try this Bloom Daily Planner or get your FREE PRINTABLE here. Writing it out kind of seals the deal if you know what I mean. When you make your to-do list the day before, you have already set your goals for the day and know what needs to be accomplished. Because of this, you are able to better determine how to do that and can really plan ahead. By planning ahead, you are prioritizing your time and tasks, meaning you will surely have a more productive day. 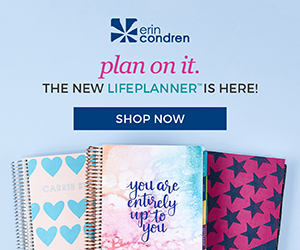 Have you ever used an Erin Condren planner? Check them out below! 3. Ever heard of personal devlelopment? It’s a great way to set the tone for the day. In fact, the way you start your day has a huge impact on how successful the rest of your day will be. Try some daily affirmations or start your morning with a chapter from a really good personal development book. Check out some of my favorites below. There are so many resources at our fingertips these days, so use them to fulfill your true potential. When you invest in yourself, you are able to really asses and evaluate your strengths and weaknesses, improve your mind, and who knows – maybe you’ll discover something you are passionate about! 4. Block off time for yourself. This is so important for your sanity. Take the kids to the park, an indoor play place, pop in a movie – anything to give you a breather. Mama needs to be ready to run when the time calls. Don’t forget about self-directed play! Kids need the time to play independently and learn by exploring the world around them. So what does this have to do with you taking time for yourself? Well, self-directed play encourages children to be more self-sufficient and to use their imagination, allowing you some free time to get things done for yourself. This post here talks about self-directed play and helping to set a schedule. Free customizable planner included! 5. Go to bed earlier. This will not only help you to begin setting your plan for tomorrow, but also to get the rest you need. Those little ones are relying on you to have it together so their day runs as smooth as possible. Being well-rested is also part of self-care and setting your limits. 6. Be realistic. Kids are unpredictable at times. They become tired and overwhelmed just like we do. Maybe your storytime just doesn’t work that day, or sweet little Lucy wakes up with a stomach bug – it happens and the show must go on, maybe just not as planned. Do your best. I don’t know many people who do it better than moms, and you are no exception. What does your daily schedule look like? Do you plan ahead, or are you a fly-by-the-seat-of-your-pants kinda gal? I’ve been both! Leave a comment below!